The resort of St Leonards, where development started about 1828, was laid out by J Burton, father of the more famous Decimus. Though mainly a surveyor, he designed a chapel in 1831 (Colvin 4th ed p203),which was completed in 1834. The dedication derived from the name given to the resort, which in turn came from what was wrongly believed to be that of the parish church at Hollington. Horsfield describes this chapel as in the C13 style (I p458), which as understood at the time meant over-sized lancets, no aisles and a square battlemented tower. J Billing re-ordered the interior and added transepts from 1862, though a contemporary report (B 20 p517) suggests there was neo-Norman work, which, if correct, would probably have been earlier. 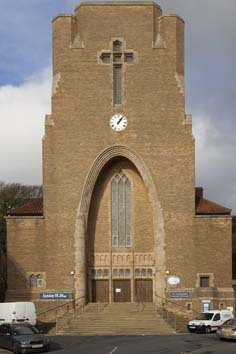 This church was bombed in 1944 and replaced between 1953 and 1961 by Sir Giles G Scott and A G Scott (RIBAJ 70 p298). Like its predecessor, it faces the sea and stands in a gap in the blocks of housing. Because of the lie of the land, only the façade, which actually faces south (though the liturgical terms are used here), is easily visible. This consists largely of a massive oblong tower with lower octagonal corner-turrets. A parabolic arch contains the west window and a triple entrance. The Scotts usually designed their churches in a free form of gothic, but apart from the general outline this applies here only to the doorways and perhaps the diagonal tracery in the windows. In the tower there is a large bell-opening shaped like a cross to the west and plain triple openings on the other sides. 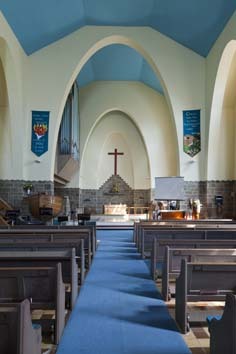 There are more parabolic arches inside, across the west end, which has a gallery, and along the side-walls, and in the chancel a succession of arches diminishes in size towards the altar recess, which has a large red cross above the dado of blue-grey stone. Such successions of arches were a feature of Giles Scott’s later work in particular. 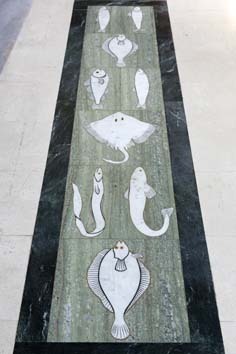 A wavy moulding along top of the dado represents the sea and many fittings (see below) pursue the analogy (ibid), including the chancel floor of green marble inlaid with a variety of fish. The church has suffered serious structural problems, caused in part by rusting steel ties in the walls and partly by a mudslip and other pressure from the higher land behind, which had already led to problems in Burton’s church. Repairs were costed by R Wood at £1.5 million (1 p12) and in 1998 this led to a proposal for redundancy, but the problems were overcome for a while and the church remained in use in a united parish with St Ethelburga’s. Sadly, no permanent solution was found and after a recurrence the church ceased to be used for reasons of safety and was formally closed in August 2018; ironically the final service had to be held in St Ethelburga’s. Font: Wood and movable, carved by J Reid with the Nativity. 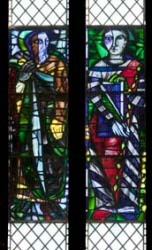 Glass: Nine windows contain panels of figures set in plain glass, P Reyntiens, 1957 (DSGW 1972). Those to the left, when facing the altar, depict Old Testament characters, whilst others from the New Testament are opposite. 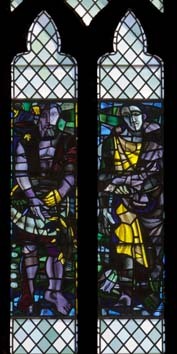 The glass of which the figures is composed is dark, so the panels are set in clear glass to ensure there is enough daylight in the church. 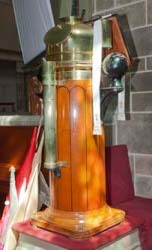 Lectern: Shaped like a nautical binnacle. 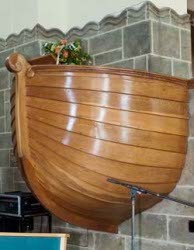 Pulpit: Shaped like a boat and made on the shores of the Sea of Galilee (BAL Biog file for Giles G Scott).